The mission of the Archives & Records Department is to administer the Archives & Records program which manages records created by the Diocese of Savannah; to serve as the institutional repository for records of historical and enduring value; and to promote an understanding of the Catholic Church, her history, and her heritage in South Georgia. The department is erected in accordance with Canon 482. 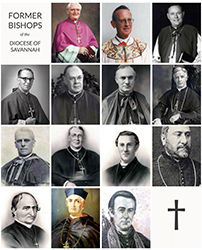 The Diocese of Savannah Archives was established as a private, institutional collection in accordance with Canon 491 to store and provide access to the permanent records of the Diocese of Savannah. It primarily collects inactive original records created by the work of Diocesan administration, parishes, and schools. A select secondary collection is maintained to document Catholic culture in Middle and South Georgia. The Archives principally serve Diocesan personnel, parishes, and schools. Because these are institutional records, only some are open to public for research and may require permission to access. Donations are accepted when they are consistent with the collection policy. Work in the Archives – Join the Diocesan Archives & Records team! The Archives & Records Department offers skill-building internships working with the history and material culture of the Catholic community in Southeastern Georgia. Internships can be tailored to develop skills in primary source research, collection arranging and describing, preservation or other Archive & Museum fundamentals. Programs can be structured to meet course requirements, graduate or doctoral goals, and schedule or travel needs. The Archives & Records Department appreciates anyone with an interest in history, record keeping, or archives who is willing to volunteer their time and skill set to protect the cultural heritage of the Catholic Church in Middle and South Georgia. We will match your skill set and past experiences with our needs.